I am not sure if you remember or not back when I posted about setting up my Wayfair Christmas tree and how I opted to NOT use the stand that it came with? Well that turned out to be disastrous. If you follow me on FaceBook you already know that the tree ended up toppling over a few days later. That led to us placing the original stand on the tree. I STILL wanted my galvanized tub though so I was a lady on a mission! 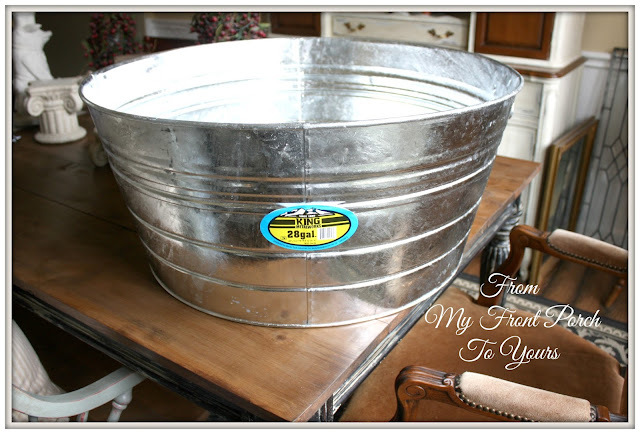 After calling around we drove 30 minutes to The Tractor Supply Store in a neighboring town to pick up a larger galvanized tub. I used 5 inch wide burlap ribbon. 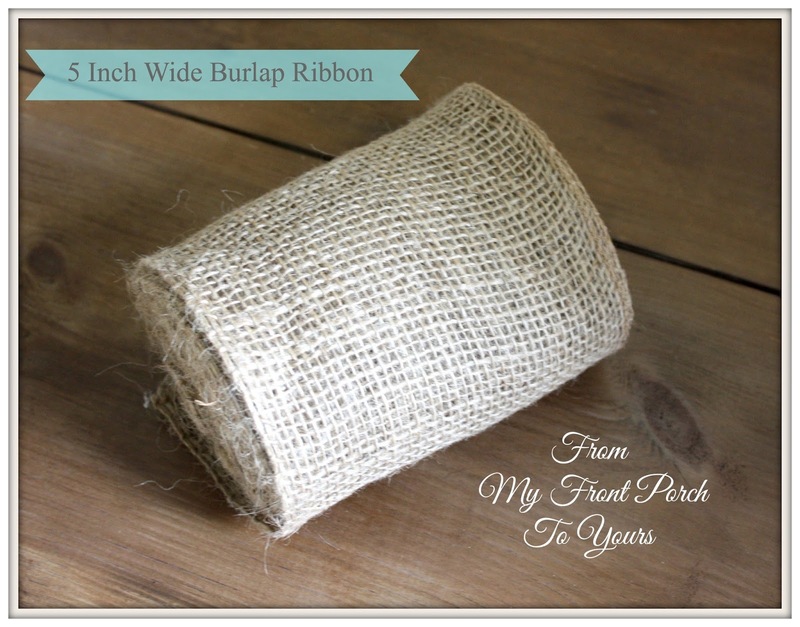 You can pick up 5 inch wide burlap ribbon at any craft store. I got mine at Michaels. Next up I hot glued the burlap ribbon all the way around the tub in the center. You do not need a lot of glue. Just small drops on the edges every few inches will do. Be careful when you push the ribbon down though because the glue will ooze out every now and then. Next up I ripped up a twin size white sheet I had on hand. 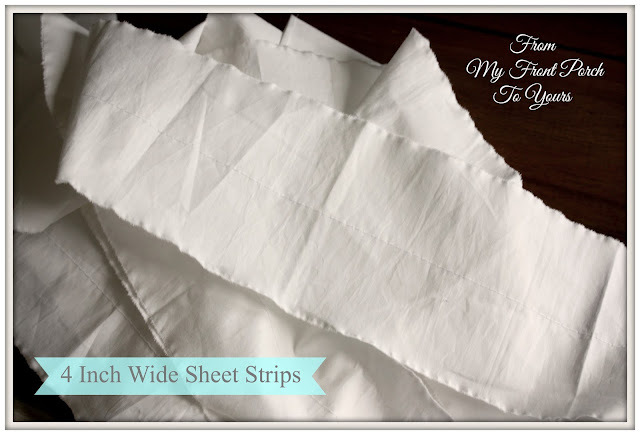 I wanted unfinished edges so all I did was rip the sheet in about 4 to 4.5 inch strips. Next I stitched down the middle. 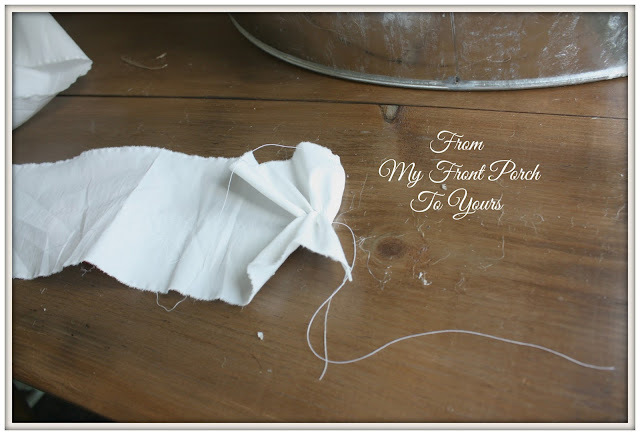 You will need to secure your stitch with a few stitches when you first start. I use a 2 for the stitch length on my sewing machine to secure the stitch then I switched over to a 5 which is a very loose stitch. DO NOT secure your stitch at the end. Make sure to leave enough thread at the end for pulling. Next separate your top and bottom thread. Tug a little on them both to see which one starts to scrunch the fabric up. Whichever one it is that is the one you want to carefully pull on. DO NOT pull too hard or you will pop your thread and have to start all over. As you pull you will need to work your ruffle down to the end of the fabric if that makes sense. After you are done ruffling you will have a strip half the size of what you started with. Because of this I made four identical strips to make sure I had enough length to go around the entire tub. After you are done ruffling it is now time to loosen up your ruffle. 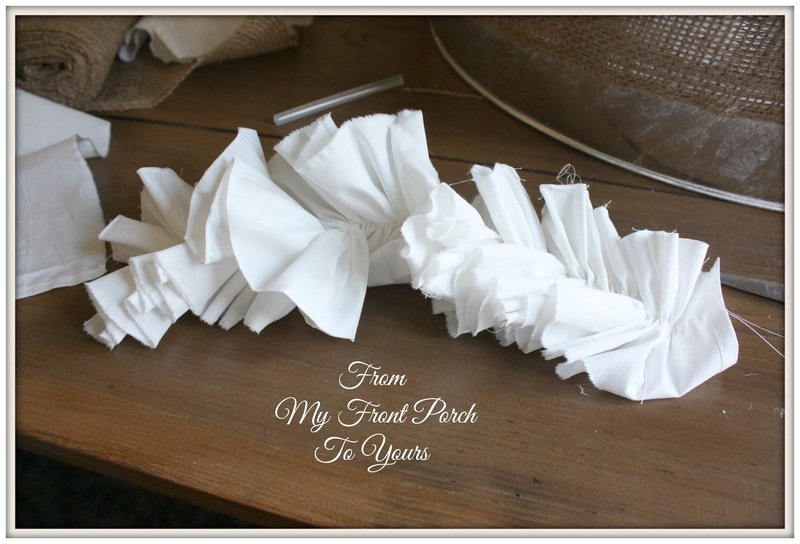 Carefully play with the length making sure that you have the ruffled spaced out nicely. 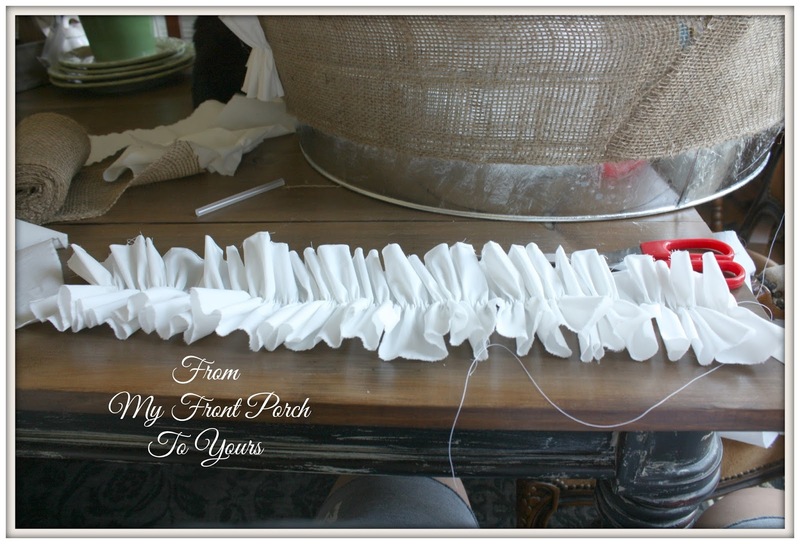 After you are happy with your spacing then tie off the end of your ruffle. I tied mine off three times to ensure it would hold and not pop thru the fabric. 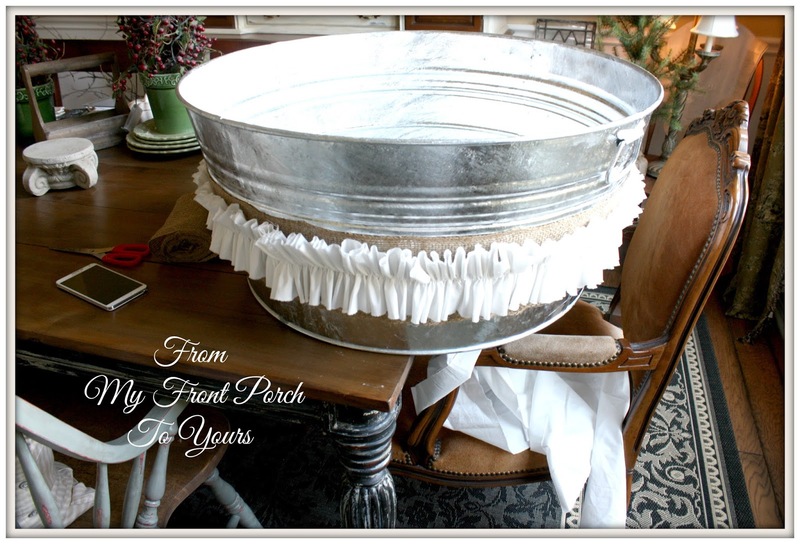 Next up I just hot glued the strips of ruffle around the tub. Where one strip ended I just started another and it looks seamless all the way around.You can not tell I used four different strips. Now you have a prettied up galvanized tub for your Christmas tree. Be sure to come back by on Friday for my tree reveal! It looks completely different from years past. What a great idea Pamela...it looks great!! Can't wait to see your tree! I have my tree in a tub painted white now you have given me an idea to bling it up some. Really cute idea. Now that is really cute!!! Love it Pamela! I love what you did to the tub. I've never tried using one for my tree but I think I will this year. Great idea ! 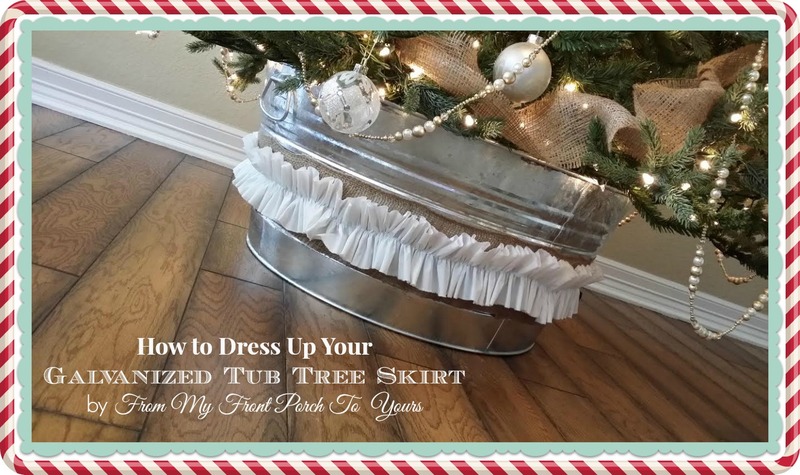 I have my big tree in a galvanized tub because of seeing yours in a tub last year ! Love it ! 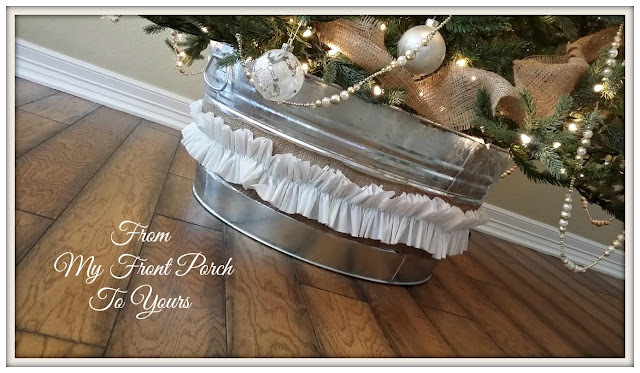 What a wonderful way to decorate your galvanized tub! I love the burlap with the ruffle on top. Our Michaels didn't have the burlap ribbon when I went there a few weeks back, so I had to order mine on line though Grandin Road. What a cute idea, Pamela! Love the ruffles. 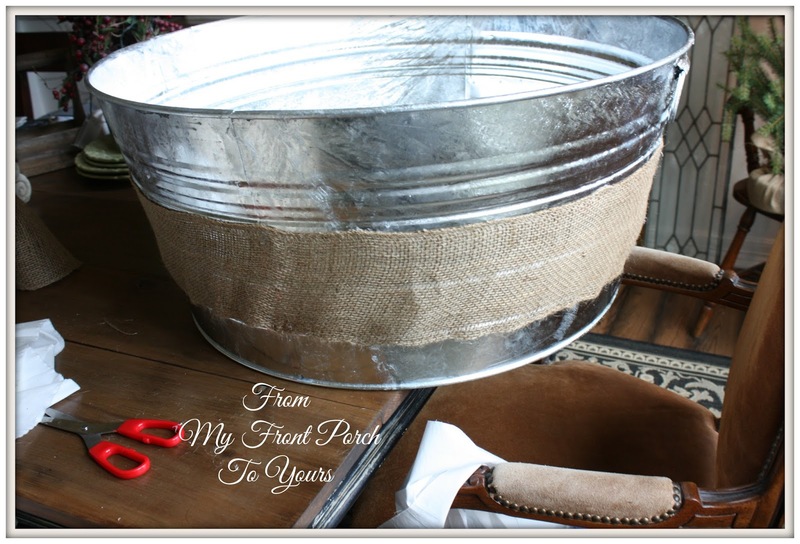 The Tractor Supply Store always comes in handy for so many ideas! 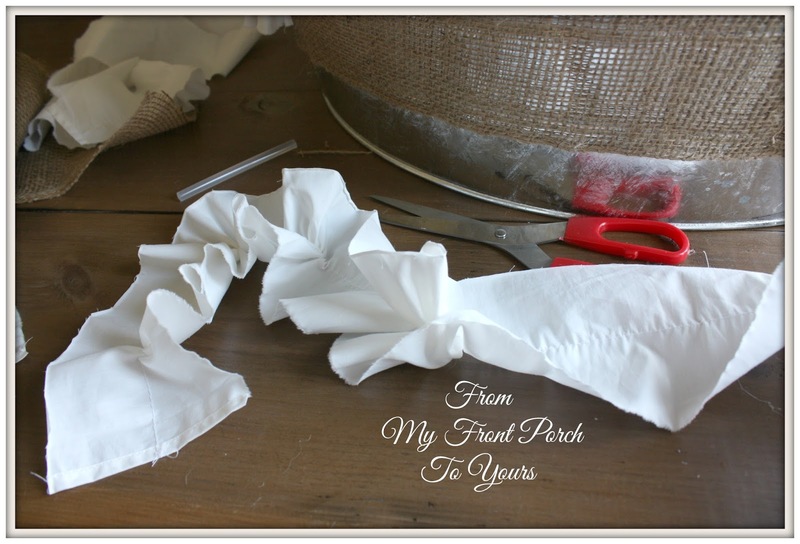 Looks darling...thought you might like to know there is a much easier way to make the ruffle. I have found you can just keep scrunching the fabric up as you sew and it creates a great ruffle look. Just a tip... Glad you were able to find the tub! so fun. love the addition of the ruffle!! Pamela, I love it, I want to do this or something similar to our trees next year in the new house. I can't wait I have so many ideas. well now, that is adorable! That's the fanciest tub I've ever seen! ;) It looks gorgeous. I may have to do something similar for my tree in the foyer! I love using galvanized tubs for trees. I like how you added that pretty ruffle around yours. It really does make it flow with the other decorations on your tree!